Alien vs. 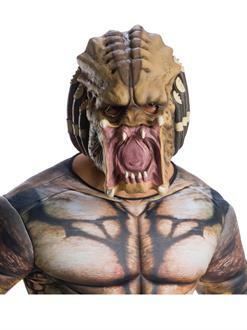 Predator just became real with our Predator Men’s 3/4 Mask. Men everywhere look for a reason to armor up and role play this notorious trophy hunter. Our vinyl mask, made to look like steel armor, is secured with an elastic strap around your head. This is the perfect guise for your next costume party or Halloween. Beware, government, and good luck in wartime. The Predator pressure is on!